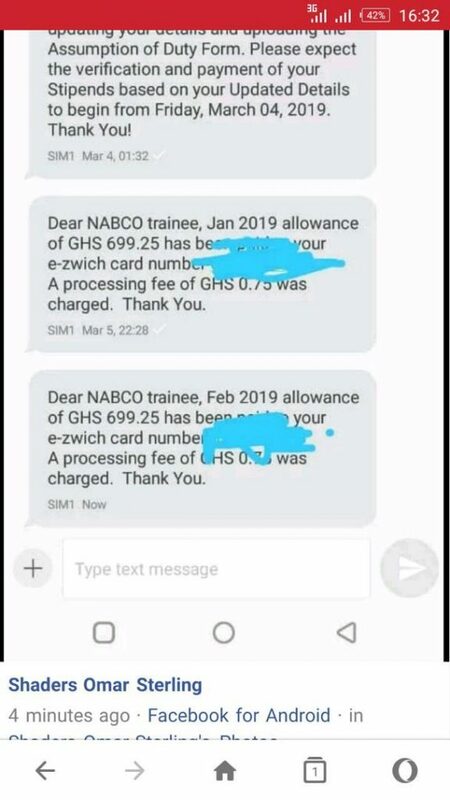 It has been officially confirmed that NABCO has started the payment of 2019 Stipends to Trainees under the programme after some trainees decided to go on demonstration. However, only February 2019 Stipends have been paid so far. Screenshots sighted by Asetena.com confirms this from multiple Trainees. We can confidently confirm that at around 03:38 pm today, Wednesday, 10 April, 2019, NABCO has started the payment of the stipend for all confirmed trainees. Trainees have started receiving alerts on the payment. January Stipends were paid on 5th March 2019. Does this mean March Stipends will be paid somewhere the middle of May 2019? NABCO is also preparing to send new contracts to Trainees and this is expected to happen anytime this week. There is no indication that the filled timesheets were used to process the payments but if this is the case, then districts where coordinators still have not sent the sheets will have a delayed stipend payment. All trainees who have not received their Stipend yet can patiently wait as the payments is done in badges.